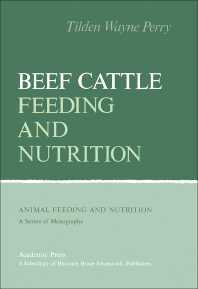 Beef Cattle Feeding and Nutrition is the third in a series of books on animal feeding and nutrition. These books are designed to keep readers abreast of the rapid developments in feeding and nutrition. These developments have resulted in changes in diets, the use of new feed processing methods, improved use of by-product feeds, and more supplementation with minerals, vitamins, amino acids, and nonprotein nitrogen compounds. The book is organized into four parts. Part I focuses on the nutrient requirements of beef cattle. Beginning with a review of rumen physiology and energy requirements, the remaining chapters discuss the vitamin, mineral, and protein, requirements of beef cattle. Part II on feedingstuffs includes studies on pasture and other forages; hay and haylage making; silage and crops for silage; and concentrates for beef cattle. Part III includes studies on breeding herd nutrition and management; and milk production and calf performance. Part IV on cattle finishing covers cattle finishing systems; feedlot disease; and economics of cattle feeding. II. Custom Feedyards—What Are They and How Do They Work? Appendix II How Much Can I Afford to Pay for Feeder Cattle?